Lost to the world until 1957 when they were accidentally discovered by archaeologist Dr. V.S. 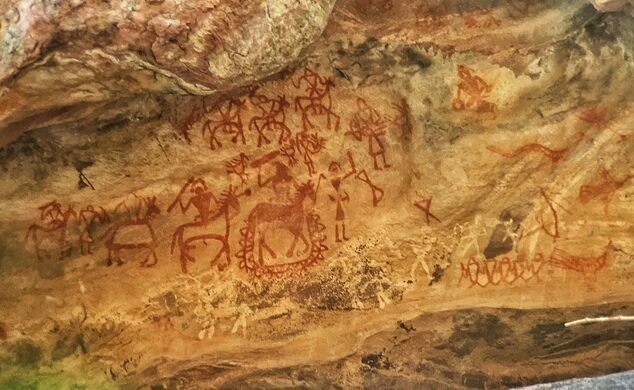 Wakankar, the Bhimbetka Rock Shelters are the largest repository of prehistoric art in India—and possibly all of Asia. This 60-year old restaurant is proud to be built atop an Indian burial ground. 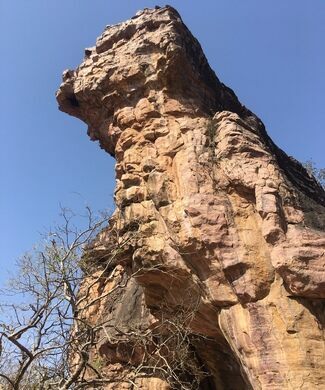 The rock shelters were carved by wind and rain out of hills and boulders in this forested region, about 30 miles from the capital of Madhya Pradesh, Bhopal. They contain evidence that people inhabited these shelters and caves as far back the Lower Paleolithic period, more than 200,000 years ago. 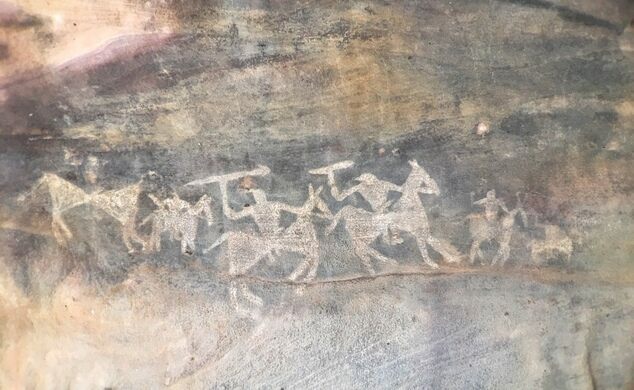 Out of 760 rock shelters, about 500 are painted with scenes that depict local birds and animals, mythological figures, and everyday scenes of people hunting, playing, and carrying weapons such as swords, spears, and bows-and-arrows. 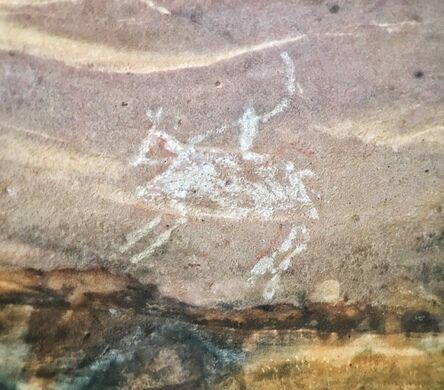 The rock paintings range in color, from white, red, green, and yellow. They date from between the Upper Paleolithic Period, about 30,000 years ago, through to the medieval era in India, about 1,000 years ago. The oldest paintings are white, with the newer paintings in red. The paintings become more sophisticated through time. Elements such as movement, perspective, and recognizable religious figures can be seen in the newer paintings as they change from linear to more evolved shapes. 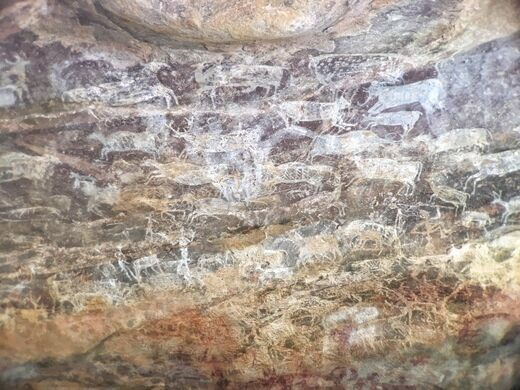 One of the highlights of the Bhimbetka Rock Shelters is “zoo rock.” Paintings of a variety of local animals cover a large rock face. 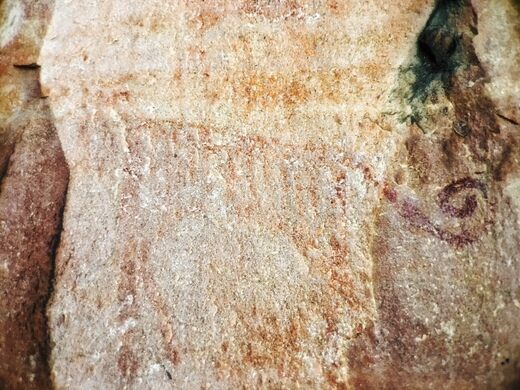 Many have been superimposed over others, as the artists who made these painting often used the same rock faces as their ancestors. The paintings on this rock range from the Mesolithic Period to the Medieval. 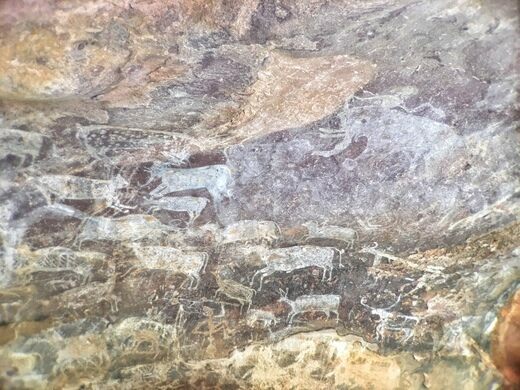 The Bhimbetka Rock Shelters gives visitors a glimpse into man’s prehistoric past, and the changing technology, clothing, culture, and lifestyle over a long period of time—from a nomadic to a settled agricultural lifestyle. They represent a living document in vivid color on a surface that is also changing due to wind and weather. Even the name is mythological in scope, taken from the Mahabharat, the longest epic in the world. One of the Pandava brothers, Bhim, was said to have stayed in these caves after he and his four brothers were banished from their kingdom. “Bhim betka” means the place where Bhim sat. 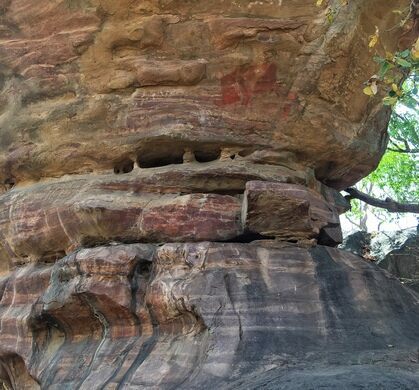 The Bhimbetka Rock Shelters became listed as a UNESCO World Heritage site in 2003. Only a small part of the site is open to visitors. A sign-posted pathway leads to about 15 rock shelters with paintings. There is a 250 rupees entrance fee for foreign visitors. A fresco in this magnificent palace is said to have been the first depiction of the Taj Mahal's design. A centuries-old fortress city lies in ruin. This reserve is the only place in the world where you can see the Barasingha swamp deer in the wild.